Osheaga is gearing up for its 2018 edition in Montreal, but the party will get started a little earlier with a Toronto event. On June 16, organizers will host the Osheaga Block Party in Toronto at 181 Sterling Rd. across from the Drake Commissary. The event comes as part of the upcoming NXNE in the city, and the lineup has just been revealed. 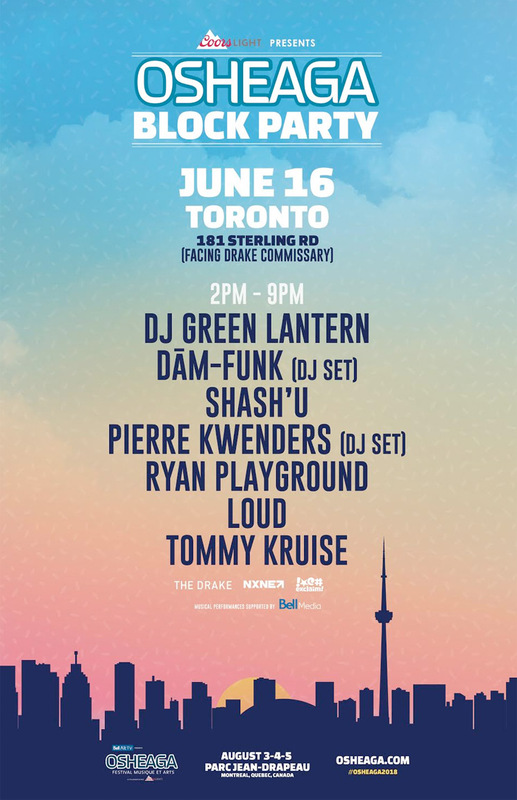 Playing the Osheaga Block Party are Tommy Kruise, LOUD, RYAN Playground, Pierre Kwenders (DJ set), Shash'u, DāM-FunK (DJ set) and DJ Green Lantern. You can learn more about set times and specifics over here. Osheaga takes place at Montreal's Parc Jean-Drapeau from August 3 to 5. It features the likes of Travis Scott, Arctic Monkeys, Florence and the Machine, the National, Post Malone, Yeah Yeah Yeahs, James Blake, Rae Sremmurd and more. You can learn more here. NXNE, meanwhile, takes place at various venues in Toronto from June 8 to 17. You can learn more here.